Synchronicity is the experience of observing two causally unrelated events and perceiving them as related. A famous example is watching the Wizard of Oz while listening to Dark Side of the Moon – If you haven’t tried “Dark Side of the Rainbow, check it out. Darwin’s theory has much to say about why we see connections in unrelated things. MIchael Shermer’s book and Ted Talk are good places to learn more. Sometimes, though, it is better to just enjoy synchronicity’s fruit! 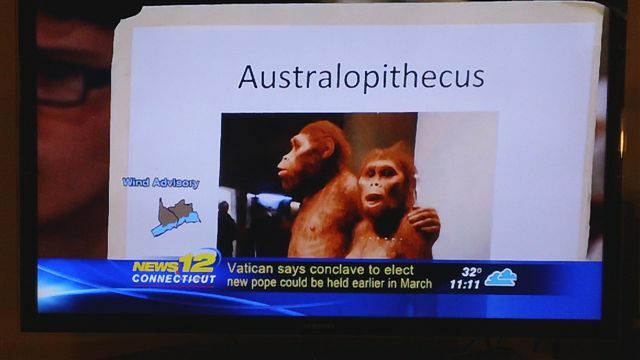 This entry was posted in Catholic Church, Charles Darwin, Cognition, Congregation for Humanistic Judaism of Fairfield County, Humor, Organizations, Religion, Synchronicity and tagged Australopithecus, Cardinals, Conclave, Darwin Day, Evolution, Pope by danblinn. Bookmark the permalink.